The 200-2510-A / 200-2511-A Totalizing Anemometer is equipped with a counter to provide a simple, yet precise, method of determining average wind speed and total air passage. It has been redesigned to replace the old mechanical instruments that are no longer being produced. The new unit is self-contained and consists of an anemometer for wind measurement readings and a programmable 8-digit electronic LCD digital display that converts cup rotation to counter increment. Average wind speed can be calculated from the difference between successive counter readings divided by the time interval between readings. The easy-to-read display is housed in a NEMA-4X enclosure and is powered by an internal lithium battery with a 5+ year life. The unit can be calibrated to readout in miles or kilometers. 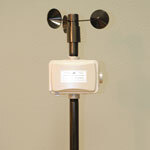 In an evaporation station, the anemometer is typically mounted on the platform supporting the evaporation pan. The unit is supplied with a pre-drilled mounting flange for this purpose.